Huffington Post has never been known for having a very discerning eye when it comes to content choices. The site publishes about 100 original pieces a day in its politics section–about half of which are unpaid blog posts that get very little attention. But as the New York Times‘ Nate Silver explained in a numbers-heavy analysis earlier this year, even a post that garners just several hundred page views earns HuffPo a few bucks in ad revenue. That means it literally pays to have content of questionable quality constantly flowing onto the site. 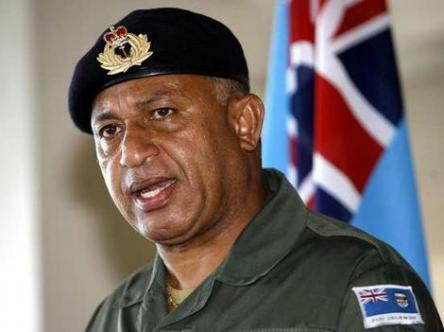 Could this numbers game explain why HuffPo published a piece by the head of Fiji’s military junta and self-appointed Prime Minister, Commodore Voreqe Bainimarama? Perhaps it was snookered by the subject matter. After all, Bainimarama was using the HuffPo platform to announce a “win for the 99 percent” by way of tax cuts on the poor and middle classes, as well as a temporary “Social Responsibility Levy” on the top one percent. What could be bad about that? Well, it turns out, quite a bit. In a response post, published by HuffPo last week, investigative reporter (and WNV contributor) Anna Lenzer explained what’s really going on in Fiji. HuffPost readers could be forgiven for not noticing that the piece was written by an unelected dictator under targeted military sanctions by the United States, who has placed Fiji under martial law and outlawed freedom of speech, press, assembly, and association. Nothing in the post even hints at Fiji’s nightmarish human rights conditions or the writer’s status as an international pariah, though his bio does contain his curiously long list of additional titles including also being Fiji’s self-appointed Minister for Information and Minister for Finance. Lenzer detailed much of the dissent surrounding Bainimarama’s regime in a three-part series for Waging Nonviolence earlier this year. Now, she says, the regime is trying to mount a massive PR campaign to quell its increasingly deteriorating image–turning to the PR firm of the dictators for help. Qorvis director Tina Jeon (whose Twitter bio notes that she’s a “Yalie”) has issued a series of tweets since the firm’s contract began about her time in Fiji, noting her excursions to Bainimarama-led events like the big opening of a Chinese bauxite mine. The most stunning such tweet contains a picture of a young woman sitting on a yacht, typing into a smartphone as Bainimarama stands beside her: “No better place to write a press release.. #Fiji,” the tweet reads. Even though Qorvis was specifically hired to facilitate such news placements and has done so for its other autocratic clients — such as when the firm placed an article by the President of Sri Lanka in the Philadelphia Inquirer — HuffPost’s blog editor told me that Bainimarama’s post came directly from the junta’s head office. Not exactly the mea culpa readers deserve. In essence, HuffPo is saying Qorvis is a red flag, but a dictatorial regime is not. Is the 99 percent meme so powerful these days as to cloud the truth? Lenzer seems to think so. The Fijian junta’s cooptation of the 99% meme as it outlaws and brutally punishes any form of protest is a meta-lobbying joke well-played on HuffPost readers. Rather than champion the 99%, as his post claims, Bainimarama has, since seizing power in his 2006 coup, displayed utter contempt for all of the values that the Occupy movement has been fighting for. He has shunned western democracies while accepting hundreds of millions of dollars as well as military aid from China, where he has said that he’d like to see the United Nations moved. Local Fijian councils who don’t support the regime just announced that Bainimarama is threatening to withhold money from their regions if they don’t fall into line. Bainimarama’s war on the 99% is perhaps best epitomized by his escalating attacks on Fiji’s unions and persecution of the country’s union leaders, through draconian decrees, denying permits for meetings, detentions and beatings. It would no doubt help, though, if publications like Huffington Post refused to make themselves a platform for dictatorships. The few bucks in advertising revenue can’t be worth it.